This picture was taken with a small digital camera on a trip to Hungary some years ago. There was a huge zoo in the middle of nowhere, actually I figured it was more like a big farm. 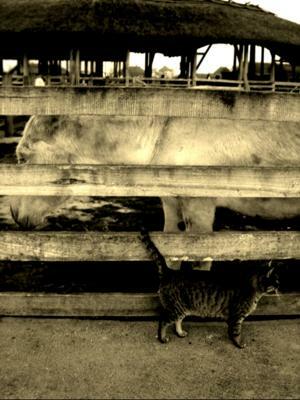 What I liked about it was that the donkey and the cat were looking in opposite directions and the fence was between them. Also the difference in colour was quite nice (white donkey, dark cat). Unfortunately, the contrast is not as good as I wished it would be (white donkey behind the light brown fence..). Now I called this one "Different" for obvious reasons, but you can interpret it in whichever way you like. I seem to have Animal Farm in my mind: all animals are equal but some are more equal than others. Equal or not, everyone is different. In one way or another.